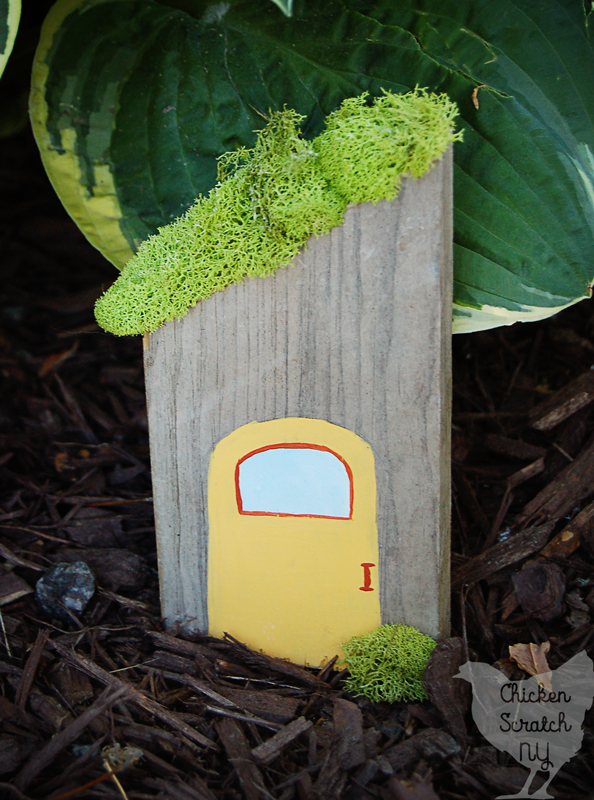 If you’ve been on Pinterest lately you’ve undoubtedly seen at least one fairy garden tutorial. They’re usually put together in a cute tub or planter, with lots of little pieces. I didn’t realize how big the fairy garden thing was until I was wandering around Joann’s and found a whole aisle of fairy garden bits and pieces. 1. 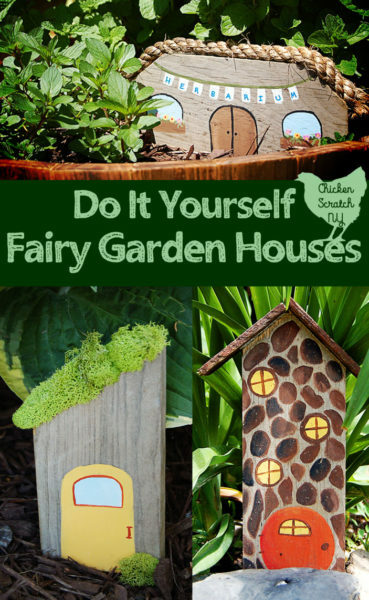 Cut out your fairy house shapes with a jigsaw or any other saw you happen to have hanging around. I didn’t have a plan, I just started at one end and worked my way down to the other cutting a variety of shapes as I went. 2. Sand off any rough edges either from cutting or from whatever damage your neglected board had to suffer while you ignored it on the deck over the winter. 3. Now the fun part! I started out tracing in some general shapes with a pencil, if I didn’t like something I just sanded it off and started over. I added the doors first, then windows and finally filled in the details like plants and even a little bird. 5. Use the hot glue to add the final touches, including the roofs. I used some moss I found in the craft room from my Easter wreath, some fish tank rocks and bits and pieces I collected in the wooded area by our house. This is a fun way to get the kids involved (Mary actually painted her own house, it is very nice 😉 ) by collecting things on a nature walk. 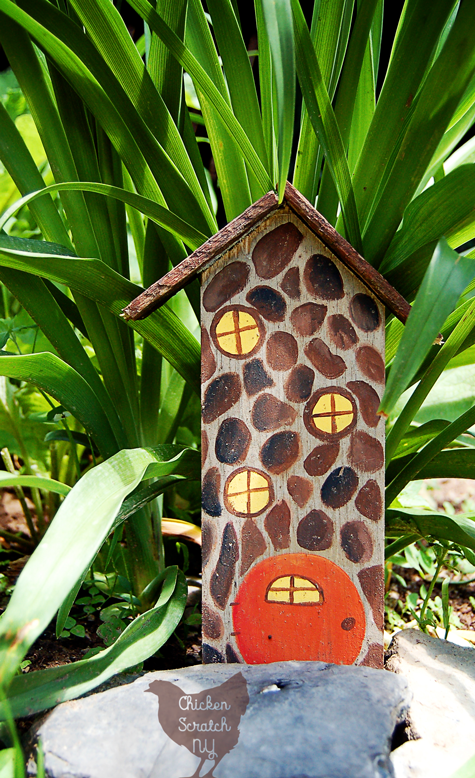 Fallen branches, bark off rotting logs, etc all make fun additions to your houses. 6. Put a tiny bit of glue in the holes on the bottom and jam in the wire, work fast or the glue will harden and you won’t be able to get the wire in. 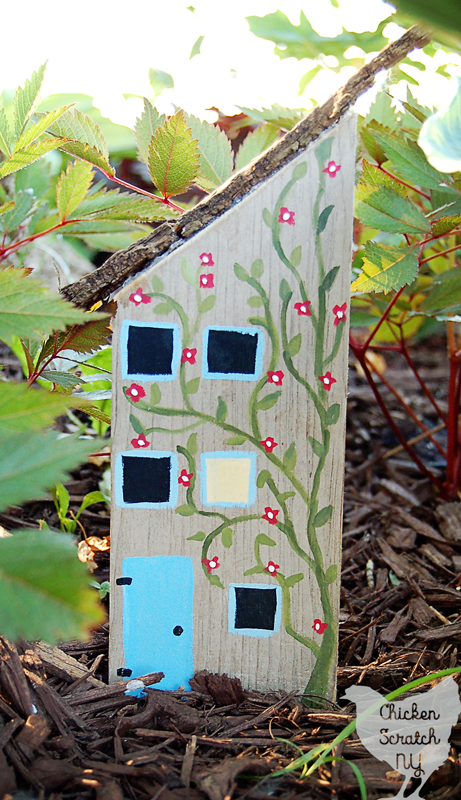 Take your houses outside and stick them where the sun shines (or in the shade, it’s up to you). 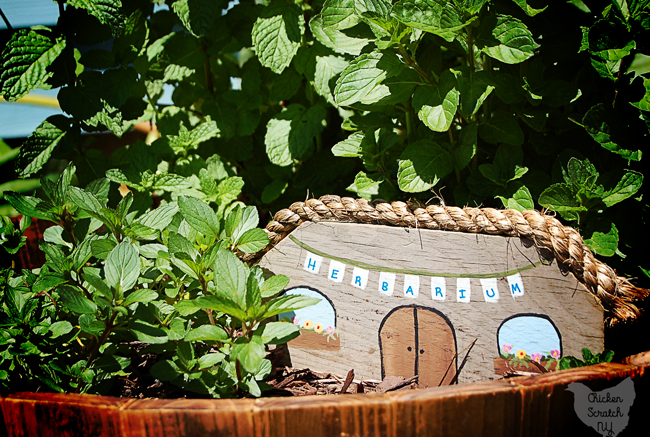 I put the little ‘Herbarium’ in the mint whiskey barrel garden in my herb garden. The others found their was into secret little spots all through out the property like the daylily garden and the shade bed. They’ve held up through two thunderstorms (they are a little protected by plants) and still look adorable. 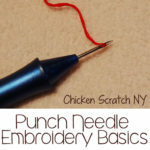 You can make them as fancy or simple as you like. This was supposed to be a stone house but I think it looks more like a giraffe. The house below is probably my favorite, mostly because the piece of curled bark I found for the roof was a perfect fit. The tiny little bird I managed to create from a little blob of paint also helps, apparently all those cookie decorating videos I watch on Facebook have taught me the value of dragging around wet paint. True story, my sister hates those videos so I try to send her one at least 2x a month. These are really darling. You did an awesome job on them! we made a fairy garden years ago. It was one of the best time we had. 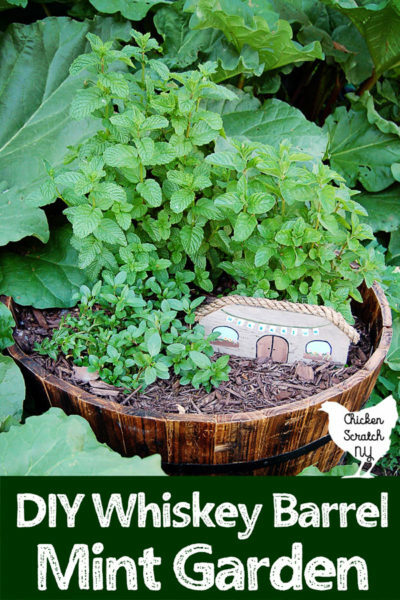 Oh this is funny – I wrote about our fairy garden today! We’re on the same page it seems. I’m totally sending this to my husband and daughter. These are so creative! 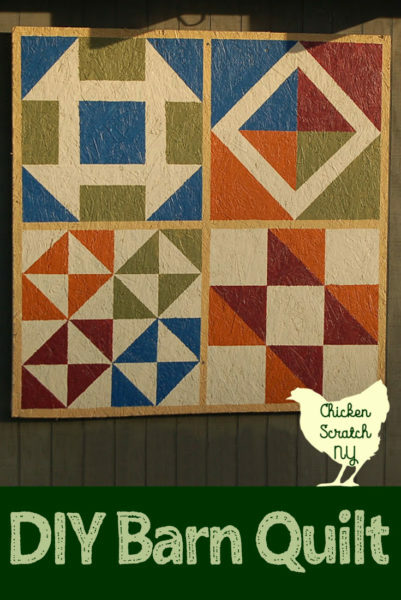 I love these and as soon as I get a garden going with the new house I get, I will definitely be creating and using something similar to these. These are so adorable! 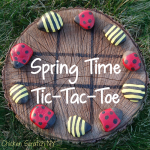 What a fun project for the kids to do with our new garden. 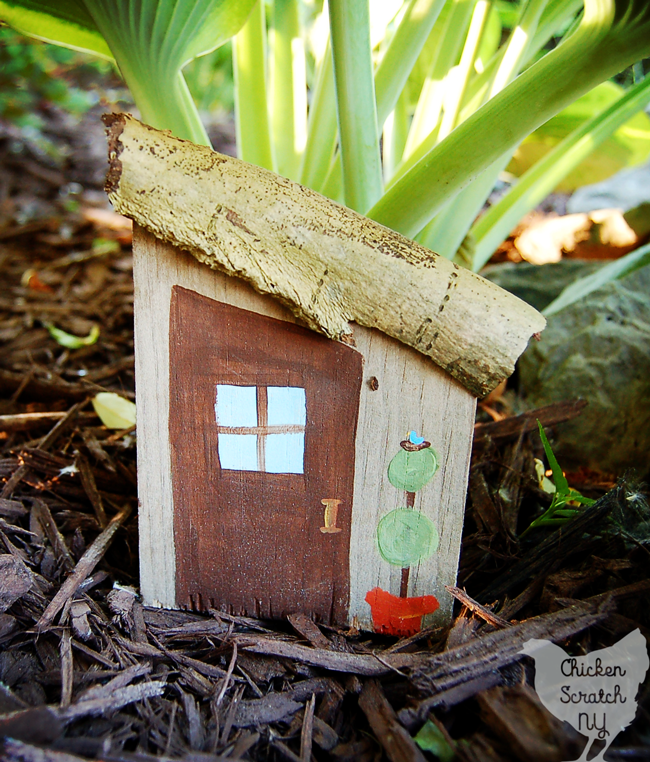 Garden fairy house.. I bet my kids would love this idea!